France seems to have a lucky star on its side, every four years when the World Cup teams are decided they almost always end up in a very favorable group, and this time around is no different. 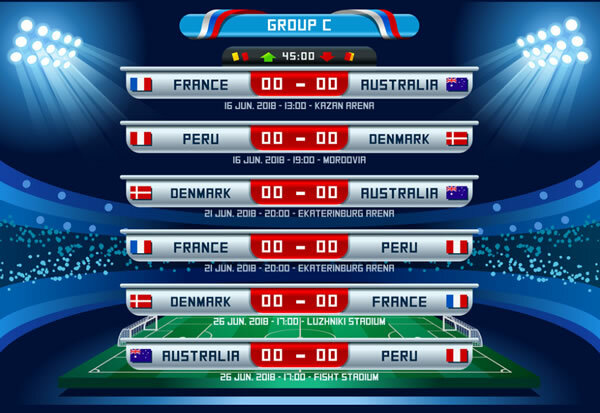 Group C includes the teams from France, Peru, Denmark, and Australia. Out of the four there is no denying that France is the clear favorite to win the group; the question here is who will take second place and advance to the knockout stage. The prediction coming out of the best pay per head company www.AcePerHead.com is that France and Denmark will be the ones to advance to the knockout round. Over the years France has been a worthy opponent in World Cup matches, but, in some of the last editions, they seemed to have lost their mojo. Well, they have found it again, and are now amongst the top choices to walk away with the prized title. France is a fast and vibrant team, they have twice taken the lead from current World Cup champion Germany, who were unable to keep up with their speed and counter-attacks. France does have issues though, most notably their lapses in concentration, being paired with weak teams in the first round might mean they get overconfident and drop the ball in trying to work on their problem areas which will affect them in the subsequent rounds. Nobody was as surprised to qualify for the World Cup than Peru. Chile was expected to make an appearance in this year’s World Cup, and even the teams of Ecuador and Paraguay had more of a chance but, neither of them made it. The real problem Peru has is the lack of international experience of its players, while some are currently playing in Mexican teams, the style of play is very different and less competitive than European teams, and this will hurt this aspiring team. To make matters worse, their start player Paolo Guerrero is appealing a FIFA doping ban, and it is unlikely he will be allowed to play in Russia. This is without a doubt the most improved team in Europe, although they have not played a major tournament since the 2012 European Championship they are undefeated in their last 11 marches. During the qualifying’s back in October 2016, they lost back to back to Poland and Montenegro, since then, however, they have won 11 games including a 4-0 victory over top seed Poland last September. They also beat Ireland in the second leg of the qualifying by an outrageous 5-1 score! Denmark will most likely be the winner of the second spot in group C, and potential opponents should be wary of them. This is the fourth consecutive World Cup appearance by Australia. Qualifying was not easy though. They had to claw their way in, but, in the end, they made it. How far they will get is another matter, unless a miracle happens, Australia won’t make it past the group stage, they might win against Peru after all this is the same team that won the Asian Cup in 2015. Australia’s strong point is their attack, a style developed by the team and which they refer to as the Australian Way. But, without a coach it is difficult to gauge how the team has prepared for the World Cup, they might surprise us, but I highly doubt it. Become a Bookie Agent today!